Want to know if the flight you’re booked on will be full or not? Check with Seatcounter.com. 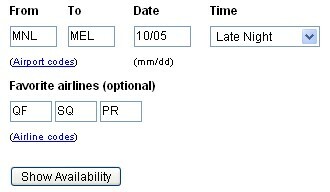 Click on Show Availability, and you will be shown a list of airlines plying that route and the number of available seats in each fare class. If you know your way around airline fare classes, this can be useful to find an award/upgrade seat. Some of the first class tickets are coded F, P (premium), A (discounted). Business class codes are C, J (premium), D (discounted). Coach or economy class are coded Y (full fare), B, H, M, N, etc. are discounted. Interesting. I must talk to my travel agent about this next time. RELATED: A380 to land in Clark? !